A lovely small-growing tree or large shrub, ‘Argentea Marginata’ boasts dark-green, spiky foliage with a creamy margin. Red berries are produced in the autumn and decorate Argentea Marginata long into the winter. This variety will grow to 4 x 3 metres in 20 years as a free standing tree and can also be used for hedging. Ideal for screening purposes or to use as a windbreak, ‘Argentea Marginata’ will do well in any well-drained soil in sun or part shade. Tolerant of exposure and coastal positions, Ilex aquifolium Argentea Marginata is a very lovely holly, perfect for brightening up a dark corner and winter interest. Our pot grown Silver Variegated Holly trees can be planted at any time of the year. Firstly, remove all weeds and grass within a metre of your desired planting hole. Dig a square hole as deep as your root mass and approximately 2x as wide. To help Silver Variegated Holly trees establish more effectively, especially if you have poor soil, we advise applying root grow by sprinkling in the hole. Gently loosen the roots and place into the planting hole. If your soil is poor, mix 50% of the original soil with 50% high quality compost, fill in the hole and firm around gently. Make sure not to bank the soil up around the collar of the tree. We recommend using a stake and tie kit and, if your area is prone to rabbits, a rabbit guard too. For further information, visit the help and advice section. 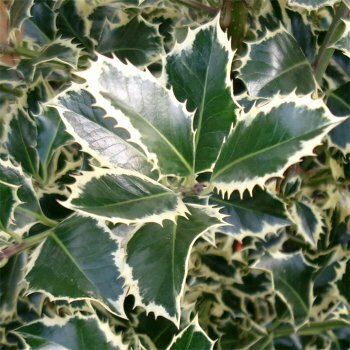 If you’re planting pot grown Silver Variegated Holly in spring, summer or dry weather, water well and regularly for the first few months. Make sure to keep an eye on your young tree and increase watering if there are extended periods of hot or dry weather. If you’re planting in autumn, you may only need to water your tree a little. We also stock a range of irrigation kits, suitable for a variety of planting schemes. Silver Variegated Holly trees do not require a lot of pruning. Simply remove any dead, diseased or awkwardly placed branches from your Ilex tree as and when you see them.